Victor Wanyama's first goal for Tottenham gave them all three points against Crystal Palace. Palace's best chance fell to Yohan Cabaye but the Frenchman blasted over from 12 yards. Alan Pardew's side have now lost their opening two games. Although he should have capped it with a goal, Spurs striker Vincent Janssen can be pleased with his contribution in his first start for the club. The 22-year-old Dutchman earned his start after an impressive substitute appearance in the draw at Everton last week and continued where he had left off at Goodison Park with an industrious performance. 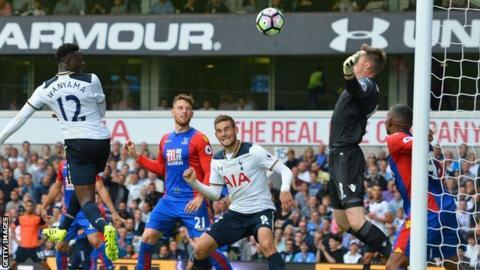 The £17m striker came close to opening his account for his new side but Palace keeper Wayne Hennessey did well to stop his shot on the rebound after Janssen had parried Harry Kane's initial attempt. Janssen was playing at the head of the Tottenham attack with Kane playing behind, and the two showed a few glimpses that the partnership could work. The mobile Janssen gave experienced Palace skipper Scott Dann a very difficult afternoon and twice drew applause from the crowd for strong challenges when tracking back. However, he will be disappointed not to have scored his first goal for the club after miscuing badly when Alli had played him in on goal. He took seven games to score his first goal for AZ Alkmaar last season - on this showing he will not have to wait that long this campaign. Palace have now scored just three times in their last eight Premier League games making it clear to see why they have smashed their club record transfer to sign Benteke. The 25-year-old Belgian might have endured a difficult season at Liverpool but has proven Premier League credentials, with 51 goals in 118 appearances. As his touchmap shows Connor Wickham was certainly willing for the Eagles but just one touch in the opposition's area proves how tough he found it to affect the game. Palace boss Alan Pardew told BBC Sport: "He's going to give us more dynamic play going forward, free up Connor and give us a different look. "We knew we needed to make changes and our fans will see we are headed in the right direction." For Benteke, and indeed Wickham, to shine they will need wingers Andros Townsend and Wilfried Zaha to have a greater impact than they had for much of Saturday's game. Man of the match Vincent Janssen worked tirelessly and fitted seamlessly into Mauricio Pochettino's system. A goal on his home debut is all that was missing from his game. Spurs manager Mauricio Pochettino, speaking to BBC Sport: "It's important to win the three points in the first game at home. I think we fully deserved it. "I am happy for Victor [Wanyama]. It's important to score and feel the love of the supporters, and I am happy with Vincent [Janssen] - he was fantastic and created a lot of chances. The supporters see he is a fighter. "Dele Alli had some problems - he was ill for three days this week and not 100%. We have a lot of games with the Champions League this season and we have to manage them to be in a better condition for the season." Crystal Palace boss Alan Pardew, speaking to BBC Sport: "We had to make a substitution at a corner, and Sod's Law, it's the one that goes in. Our effort and endeavour was there to see - we matched Spurs all the way. "We have not scored a goal yet, but I cannot fault my players. We have lost on two set plays - we are a strong set play side and we will work on it and make sure it does not happen again. "Benteke's going to give our fans and us belief. Our players are coming back slowly but surely, but it was galling today. We need one or two more players, but we are not far away." Spurs ended a winless run of five Premier League games (D3 L2) with victory today. Victor Wanyama scored just his second Premier League goal in his last 55 appearances. Harry Kane provided his first Premier League assist at White Hart Lane since January 2015 (v Chelsea). Crystal Palace have lost five of their last seven league games against Tottenham. The Eagles have won just two of their 21 Premier League games in 2016 (W2 D5 L14). Spurs have lost just three of their last 21 home matches in the Premier League (W12 D6). Crystal Palace have scored just one first-half goal in their last 14 Premier League games. Tottenham are back in action at White Hart Lane on Saturday, with Liverpool the visiting team. Meanwhile, Crystal Palace play League Two's Blackpool in the EFL Cup on Tuesday. Match ends, Tottenham Hotspur 1, Crystal Palace 0. Second Half ends, Tottenham Hotspur 1, Crystal Palace 0. Attempt saved. Connor Wickham (Crystal Palace) left footed shot from outside the box is saved in the bottom right corner. Assisted by Jordon Mutch. Substitution, Tottenham Hotspur. Josh Onomah replaces Harry Kane. Attempt blocked. Jason Puncheon (Crystal Palace) left footed shot from the centre of the box is blocked. Assisted by Wilfried Zaha. Andros Townsend (Crystal Palace) is shown the yellow card. Offside, Tottenham Hotspur. Erik Lamela tries a through ball, but Vincent Janssen is caught offside. Vincent Janssen (Tottenham Hotspur) wins a free kick on the left wing. Attempt missed. Joel Ward (Crystal Palace) header from the centre of the box is close, but misses to the right. Assisted by Andros Townsend with a cross following a corner. Goal! Tottenham Hotspur 1, Crystal Palace 0. Victor Wanyama (Tottenham Hotspur) header from very close range to the high centre of the goal. Assisted by Harry Kane following a corner. Substitution, Crystal Palace. James Tomkins replaces Damien Delaney because of an injury. Substitution, Crystal Palace. Jordon Mutch replaces Lee Chung-yong. Delay in match Damien Delaney (Crystal Palace) because of an injury. Offside, Tottenham Hotspur. Harry Kane tries a through ball, but Vincent Janssen is caught offside.